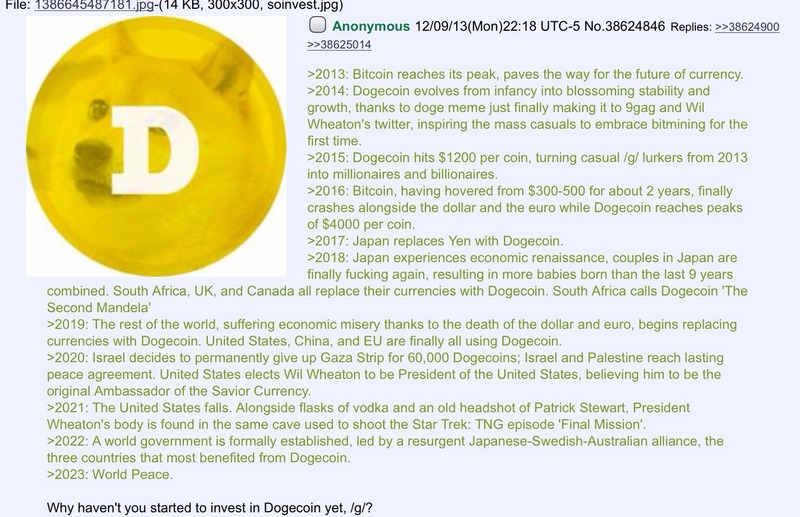 Dogecoin took the Internet by storm a week ago. Based on the popular Shiba-Inu themed “doge” meme, the new alternate crytocurrency has already surpassed Litecoin in reddit fans. The users called “shibes” dig for coins instead of mine them. The difficulty is set so low that nearly anyone can mine them. At the writing of this article, dogecoin is worth $ 0.00025. I mentioned on reddit a few days ago that “people don’t mine dogecoin to get rich, they mine it to get awesome.” I stand by this statement- in a nutshell, dogecoin is very very silly, and very fun. Currently, people are mostly buying Steam games and the like with it. Where are you based out of and how did you meet? Jackson: I’m based out of Sydney and Billy is based out of Oregon. Over the past few months I’ve been following cryptocurrency, so two weeks or so ago I posted a tweet along the lines of “Think I’m going to invest in Dogecoin #makeitrain”. A couple of friends thought it was hilarious, so a few days later I Photoshopped the famous doge face onto a coin and through it up on dogecoin.com. At this point it was just a static site with the logo, and wasn’t an actual currency yet. Billy: I’m a Software Engineer from Portland, Oregon, and Jackson is a Marketing Guru Aussie, but I only knew that cos that’s what it says on his Twitter! Basically we only met during the creation of this coin. It was my goal to create a coin that would get new people into cryptocurrency as I personally find it so fascinating, fun, and rewarding — but I didn’t really have any great idea on what the coin should be. Fortunately for me, I stumbled across Jackson’s brilliant idea of dogecoin at dogecoin.com from someone linking it in an IRC chat when it was just a splash screen and picture, and immediately thought two things: 1) “That is hillarious,” and 2) “I have got to make this happen.” So basically I tweeted at Jackson and started hacking away at it, and a few days later it was a reality! How long did it take to develop after the initial concept? I’ve heard it’s based on luckycoin- was there open source code that you just doge-ified? The timeline was pretty quick. I tweeted at Jackson Thursday, finished the coin Saturday, then we released on Sunday. Coin making (well, coin cloning), it does take quite a lot of initial time investment to learn the concepts and a decent amount of hacking away to setup your environments and dependencies and get compilation to work on various systems. But once you understand how that works, it’s pretty straightforward, which is why there’s so many of them! Get dependencies, git clone, change strings, change reward structure, change ports, generate merkle hash, create nodes, mine genesis block, customize the client, compile, and release! And then hope that people enjoy the effort, that part is actually quite nerve-wracking. Did you expect it to garner so much attention so quickly? Jackson: We initially thought it would just make the viral rounds on social media, attract a few miners for fun and then slow down. But something really interesting happened – it went from being a humorous take on cryptocurrency to actually driving mainstream awareness on the topic. People who’d never heard of or never used Bitcoin before we all of a sudden asking how to set up a Dogecoin wallet. For me, that’s the best part of it, bringing something that was previously thought to be only for “nerds” into the public eye. Billy: Haha, no, not at all! I was hoping people would appreciate the effort and enjoy the fun customized client and levity of the announcement post, but the way it has taken off is miles beyond anything I could reasonably expect. I’ve been absolutely thrilled with the reaction. I’ve actually never seen a coin grow so quickly, and in the cryptocoin world, everything moves ridiculously fast. I’ve described it as if I went and planted a single seed in the ground, then come back the next day to a fully grown forest. The other incredibly gratifying thing is seeing just how many people completely new to cryptocurrency are getting into DogeCoin. I think it could be a really good thing for cryptocurrency in general – a way for people to understand the concepts, how to mine, join pools, use the client, and trade – and really start getting into cryptocurrency and start checking out other intreguing coins and ideas that people are working on. It moves so incredibly fast and it’s all so fascinating. And finally I must say, the nonstop /g/ threads (especially http://i.imgur.com/xwgkYny.jpg) and pictures people are making (especially http://www.geek.com/wp-content/uploads/2013/12/dogegraphh.jpg) have been among the most amusing things I’ve ever seen. It’s great to see so many people are having fun with it. Are there any plans for the future of the coin or is it more of a fire and forget kind of idea? Jackson: It’s just currently the two of us, but we’re looking to involve more people from the community in actively developing Dogecoin in the future. There’s already a huge community building around it, with a sub-reddit, lively forums and a tonne of coverage online. Billy: Well I’m committed on the dev side of the coin and Jackson on marketing, and the community is working on all sorts of things – see “DogeStarter”, a take on KickStarter – http://doges.org/index.php?board=41.0 , there’s a game in the works, an Android app, a Poker site, etc. The thing I personally would love to see most, and that I hear is being developed, is a a tip bot for DogeCoin on reddit. I think people would be very generous with it and it would be exciting and fun for a lot of people. Lots of stuff going on, especially for a 6 day old coin! What would you like to see people be able to buy with dogecoin? Jackson: Anything and everything, ultimately. I think as “the fun cryptocurrency” it would be nice if sites such as 4chan, Reddit etc. somehow integrated it as a way of sending kudos or “tipping” somebody. Billy: For one thing, I am a huge eSports fan, and today I saw that a Starcraft 2 tournament was being run with DogeCoins as the reward for winning, that completely made my day. I don’t necessarily have pipe dreams that people would use DogeCoin to go to space or buy a car like they can with Bitcoin, but I love seeing it being exchanged for virtual goods like steam games and product keys (see http://doges.org/index.php?board=18.0) and given as prizes for contests and tournaments. I’ve also heard a few businesses have even started to accept it! I do hope to see the DogeCoin economy continue to grow and flourish. Are you dog owners as well as fans of the meme? Jackson: I don’t currently own a dog unfortunately (renting, so not allowed! ), but have had many in the past and love them. Are any developers working on a paper wallet or even a way to email it to a friend? It’d be really nice to give out dogecoin for Christmas. Do you think all the doge attention will anger the lolcat community? My semi serious response is, I really hope that people don’t see what happened with DogeCoin and try to make more popular-internet-memes into coins. I think a cryptocurrency based on a fun meme walks a really thin line between charming and obnoxious, and somehow the Doge meme is just so charming that it skillfully skirts that line and people can have a lot of fun with it. But I do think that if more get made like it, they could really start to become quite obnoxious and cross that line into negativity, and that would be sad to see given how positive things are right now. But, in general for any dogs and cats argument, I would say both dogs and cats are plenty adorable and there’s certainly plenty of room on the internet for both to amuse people!